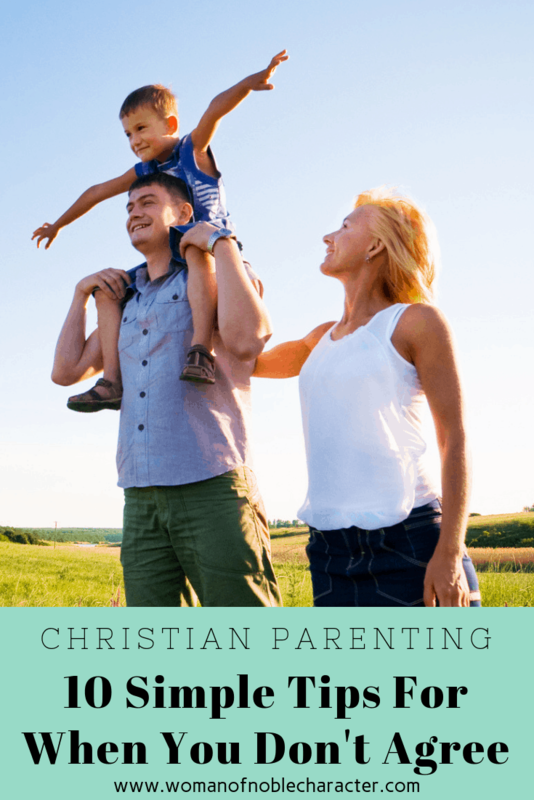 Christian parenting, any parenting is a difficult, although rewarding job. So are the roles of husband and wife. When Christian parents don’t agree on how to rear their children, it can wreak havoc on a marriage. Perhaps you don’t mind if your son or daughter stays up a bit past bedtime, but your husband insists they stay on a strict schedule. Or, maybe he doesn’t mind that they miss soccer practice, but you feel they made a commitment that they need to stick to. There are dozens, maybe hundreds of potential conflicts that arise in the life of two parents raising children. 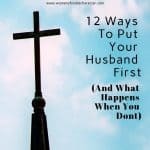 Both you and your husband were raised differently and come to this point in life with very different experiences (and expectations). It doesn’t mean that one of you is wrong and the other is right. It just means that you are different and different is good. Your differences (and how you handle them) allow your child to experience a variety of perspectives and adventures. You prefer the kids watch educational movies and he likes to watch action movies with them? Great! It’s a good balance. The Bible says that an elder (father) is to manage his own household well and see that his children obey him with all respect (1 Timothy 3:4). If the children aren’t obeying, it falls on the father (Titus 1:6). 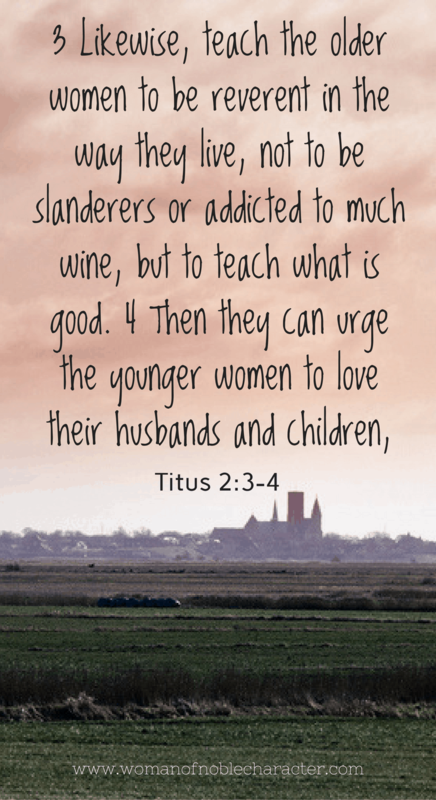 In Titus 2:3-4, we are taught that mother’s are tasked with raising disciples and teaching how to live according to God’s teachings. In the majority of homes, moms are the ones that are with the children the majority of the time. When you’re married, it’s so easy to let the little things turn into big things. A few little things can pile up and turn into big things IF you let them. Johnny wants to wear mismatched socks to church? So what? What is the worst thing that can happen? Before you act, stop, breathe and ask yourself what is the worst thing that can happen. If no major catastrophe is sure to follow, don’t worry about it. Just let it go. Kids aren’t perfect (neither are parents) and some things just aren’t worth the battle. Sometimes, however, big stuff does come up. There are certain non-negotiables (drug use, dropping out of school and others come to mind). Talk through your family values with your spouse. Come to an agreement beforehand on how to agree to deal with them. If a major issue arises that you haven’t previously agreed on the handling of, sit down and calmly talk about it. 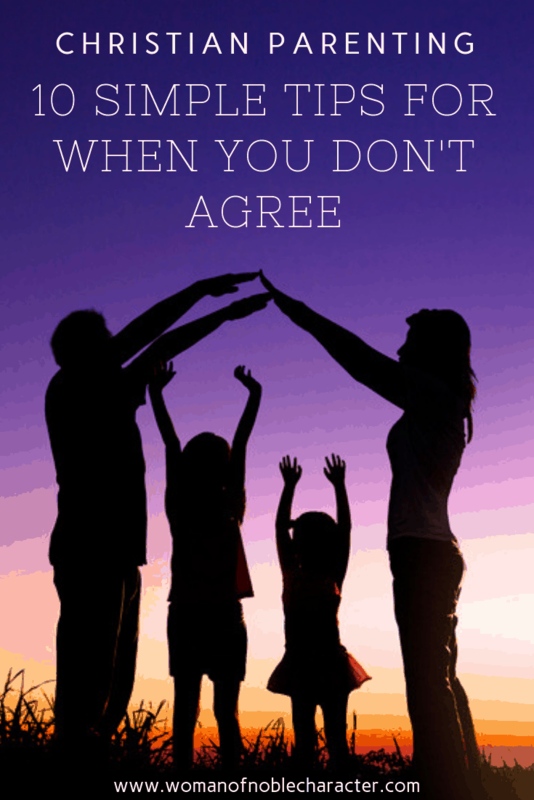 Discuss your positions and come to an agreement before addressing your child regarding it. Don’t assume that the other parent will agree with you. This goes back to understanding that you are different people with different experiences and perspectives. Don’t argue about parenting in front of your children. if necessary, agree with the other parent’s decision or action and then take time to talk about it later – away from the children. It’s not about being right. It’s about doing what is best for your children and raising them as disciples of Christ. Want more on living a Proverbs 31 Life? Grab my FREE 5 Steps Toward a Proverbs 31 Life! Yes! Please send me the 5 Steps! 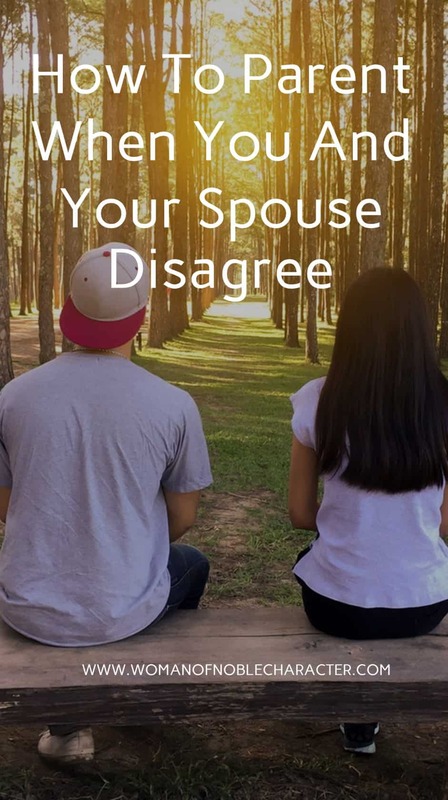 If you and your husband have already talked through your values and agree what is acceptable behavior and what is inappropriate behavior in advance, you are less likely to have major conflict. As mentioned above (#4), you’ll want to be on the same page regarding the big stuff, but occasionally issues may arise that you need to discuss before acting. If your child asks for something on their Christmas list that just doesn’t “sit right” with you, sit down with your husband and discuss it. Hear each other’s concerns and come to an agreement before talking with your child about it. It may mean compromising, but talking it through beforehand can eliminate conflict. 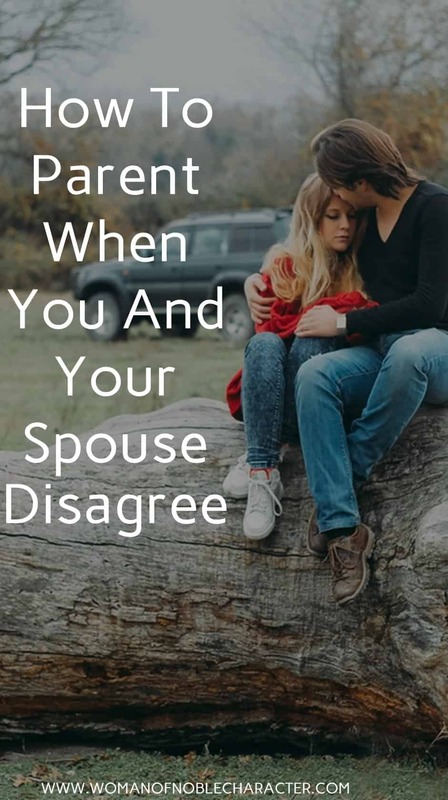 Having a plan, or rules, that you and your husband both agree on can avoid conflict. 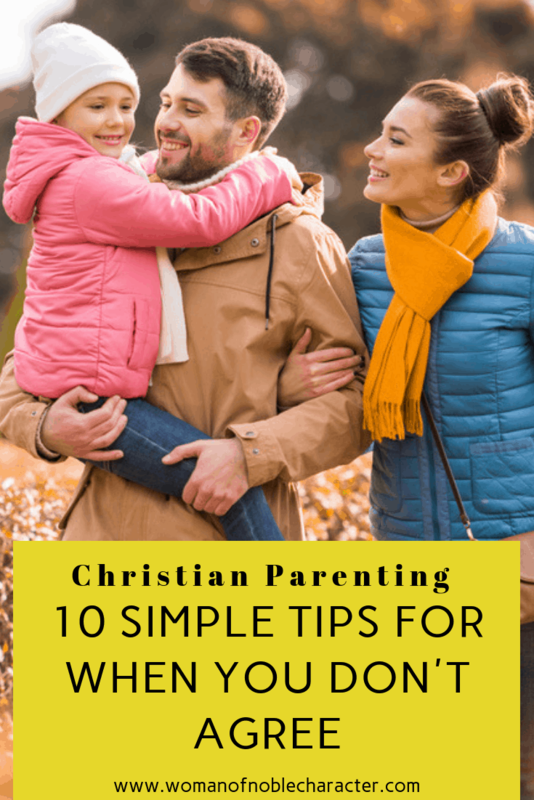 If your child asks you for something, and then goes back to dad for a different answer, that can cause not only raising a manipulative child, but marriage issues, as well. If one parent has given the child an answer on something, that parent’s decision is final. Each parent must check in with the other before giving an answer that may ruffle feathers with the other. What works for you and your family will look different than what works for me and my kids and grandkids. Take into account your schedules, personalities and other factors. Sometimes you just won’t be able to come to an agreement and may need to seek godly counsel. You may want to start by asking guidance from seasoned parents. Consider asking your own parents or other godly couples from your church for their advice. Occasionally, the problem is greater and needs more formal guidance. In this case, you may wish to make an appointment with your pastor or a Christian counselor. Christian parenting takes a village. Ask for guidance when necessary. Above all, seek counsel by reading the Bible and asking God for His divine guidance. This parenting business can be overwhelming, but I encourage you not to give up. By this, I mean, a father saying “forget it. You handle the kids” or mother’s avoiding discipline all together. Or, even the mother taking over as the spiritual (and actual) head of household and leader of the home. In effect, bullying her husband out of his role. How you parent your children and the consequences for inappropriate behavior should be flexible and may need to be changed or reevaluated as the get older. 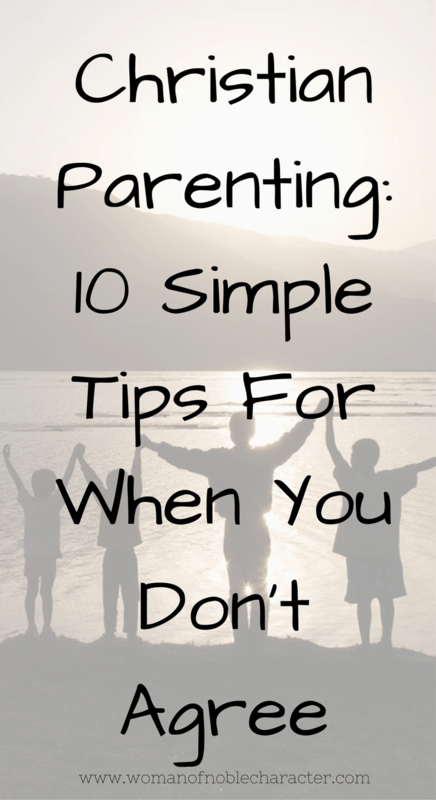 Talk regularly about parenting and reassess if something isn’t working. In addition, consider your child’s personality. Some children need more supervision, some less. Some are more manipulative, and others have more of a pleasing nature. Your style should be a good “fit” for the child’s needs. A one size fits all approach may not work. 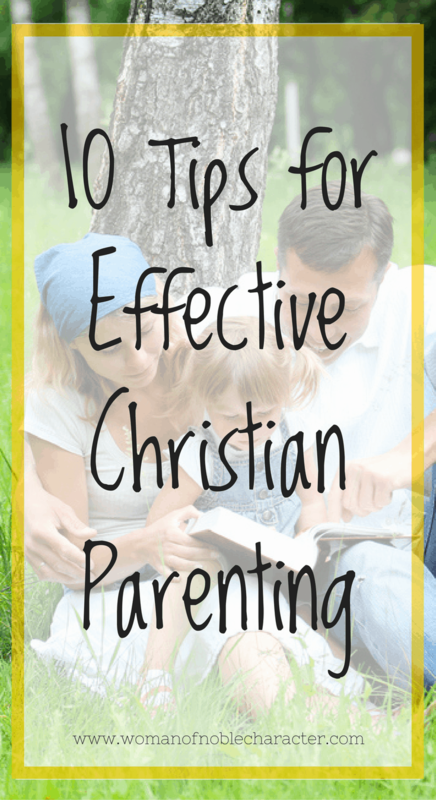 Christian parenting skills need to be fluid and based on the child and your own family values. While parenting and marriage are hard, parenting conflicts don’t have to cause problems in your marriage. Above all, pray for your children, pray for your husband and seek God first in all of your parenting decisions. 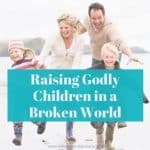 For more on raising godly children in a broken world through Christian parenting, check out this previous post. Or, for raising compassionate kids in a social media world, see this one. For more on Christian marriage, consider my book, The God Centered Marriage.